Posted January 24, 2014 & filed under Action, Events, News. 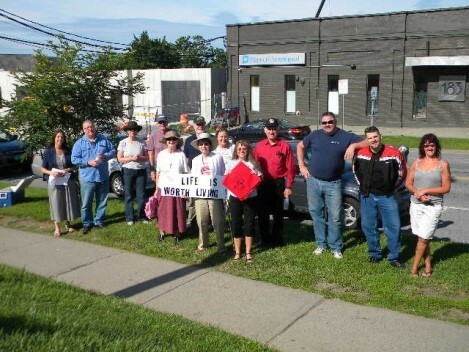 Vermont pro-life motorcycle enthusiasts rode in from all over the State to pray for an end to abortion on Saturday, July 13, 2013. Three different routes were mapped out in advance so that participants would be able to pray at Planned Parenthood abortion clinics in Rutland, Newport, and Burlington before meeting at noon to pray as a larger group at the Planned Parenthood abortion clinic in Barre. 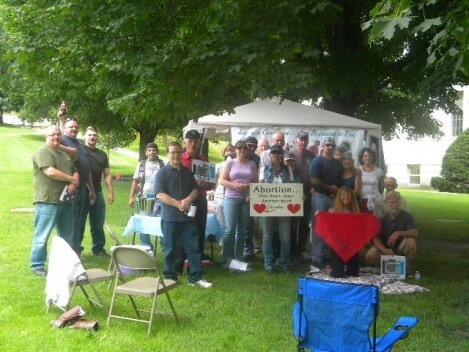 Then the riders rode into Montpelier to pray a final prayer at the State House for our lawmakers to protect human life from conception until natural death. A luncheon was served on the State House lawn and prizes were provided for participants in the Ride for Life. This is a great event! You do not have to be a biker to participate and every year more and more pro-lifers join the event by driving behind the bikers in cars decorated with pro-life banners and flags. Mark your calendar now for the next Ride for Life to be held on Saturday, July 12, 2014.